Helen Seidel, 87, of the town of Port Washington, WI passed away peacefully on Sunday, November 29, 2015 surrounded by her family at Lawlis Family Hospice in Mequon. It is difficult to begin describing this amazing woman’s accomplishments. She began her journey immigrating from Austria with her husband Peter in 1953. They first came to Canada staying with relatives with the dream of settling in America. They taught themselves English, gave birth to Elizabeth and Irene in Canada and later after finally coming to America, the youngest daughter Cynthia was born. Helen mastered the English language so well she became a medical transcriptionist at the former St. Alphonsus Hospital for 22 years. She and Peter enjoyed many years of retirement, traveling and spending time with children and grandchildren. Following Peter’s death in 1999, Helen became more involved with her passion for music. Having played the accordion for many years, she performed regularly at many senior centers and restaurants. With her dear friend Vern Karst, she produced five beautiful CD’s of old world accordion music. One restaurant in particular, Messina’s in Saukville, still plays her music. 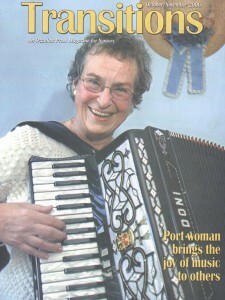 In October 2006, the Ozaukee Press “Transitions” magazine featured her on the cover holding her accordion and wrote an extensive article about her love of music. Helen was also an accomplished knitter. While shopping one day, a woman in the store commented on her beautiful sweater she was wearing. This woman, Aileen Wiltgen, who eventually became her dear friend, then encouraged her to join “Chicks with Sticks”, a local knitting club. She affectionately became known as “The Machine” because she could finish a beautiful sweater in just one week. She received no less than 33 first place award ribbons from the Ozaukee County Fair. Helen was strongly independent as recent as one week prior to her death. She was featured in an article in the Ozaukee Press on May 23, 2012 called “She Can Do It” with a picture of her holding her new chainsaw, an absolute acknowledgement to her fierce independence. Helen was born on June 2, 1928, daughter of Peter and Hermine Lechle Ecker in Wels, Austria. She married Peter Seidel on January 24, 1953. He preceded her in death on December 4, 1999. She will be terribly missed by her family and friends. Surviving Helen are her daughters Elizabeth Boone of Ann Arbor, MI, Irene (Kevin) Haley of Franklin, Cynthia Seidel of Port Washington and her four grandchildren, Houston and Brittany Boone and Kyle and Shannon Haley. She is further survived by her brother in Europe, as well as, extended family there, other family and friends. According to Helen’s wishes there will be no service and she will be cremated. Memorials to the Port Washington Senior Center, 403 W. Foster Street, Port Washington, WI 53074 are appreciated. I remember Helen as a sweet woman who talked and counseled me like her daughter. Conversations were always interesting and she talked proudly about her family <3 She was a talented transcriptionist and her knitting and piano accordion hobbies kept her so young. Sympathies and support for the family. Helen and I got to know each other while we both worked at St Alphonsus Hospital. Later, we reconnected, as she was a dear friend to my Mother. Her love of her yard continues with me, as I have many beautiful hosta plants in my yard that came from your Mother. Please accept our condolences on Helen’s passing. We have many fine memories of times spent with her and Pete. I know there are no words that can ease the pain of the loss of your mother. My sincerest condolences to you.